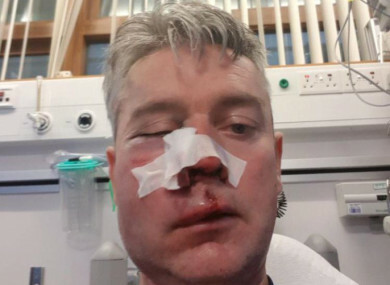 THE REFEREE WHO suffered serious facial injuries following a match in Westmeath at the weekend has said he has forgiven those who attacked him. Daniel Sweeney told RTÉ News that he holds no animosity towards his attackers, and wants to see a day when a referee can “go onto a football field, feel safe and be safe”. Gardaí from Tullamore were called to the scene of the incident at a football club in Horseleap shortly before 1pm on Sunday. Sweeney was attacked after showing a red card during the game. He thanked the public for their support, as well as staff at Tullamore Hospital. Minister with responsibility for Sport Brendan Griffin said today he was “appalled” by this “disgraceful incident”. He said he would discuss the matter with FAI CEO John Delaney. “Thousands of soccer matches take place at all levels here every week and there’s rarely any issue whatsoever,” Griffin said. Attacks of this nature are extremely rare but any such attack is one too many and we need to do our level best to ensure that the risk of such a thing ever happening again is minimised. Email “Referee who was assaulted at football game says he forgives those who attacked him”. Feedback on “Referee who was assaulted at football game says he forgives those who attacked him”.